To stop the virulent infection of Sharia law, which has colonized the late great United Kingdom, from colonizing the United States of America. There is still time, but not without deploying a rapid immunization force of freedom loving Americans who understand the threat spreading its roots in American soil, into American culture, and into your communities. London has dozens of Sharia courts already. Aren't Americans constitutionally entitled to one system of justice for all of its legal residents? Or are we about to see affirmative action for Sharia minorities? America is shown in red, the color designating the states which are still resisting the Sharia enabling toxic blue shade that is symptomatic of the "blue state" condition, i.e., the pathology of the progressive, liberal, socialist/Marxist virus. Some still dare call them Democrats, but in reality, they are destructive parasites within the body politic. From this political map you can see we have much work to do. In the Sharia Free Zone we know these blue states are the vectors of a pathology promoting the philosophy which progressively eviscerates the rights enshrined in America's constitution. To get America red enough in the next election is the immediate goal. To regain America's constitutional immunity against this and future statist infections is our final goal. We must re-zone our country. "It cannot happen here." I hear it from friends and acquaintances, and I am perplexed at these delusions, as the evidence to the contrary grows all around us. What really tipped me over the edge, was this story about bonnie Prince Charles and his invoking Islamic principles as a good thing to remedy our alleged environmental sins. Royalty certainly has its privileges. Besides the cash for being in the royal gene pool, you get a ready audience for any fatuous fancy you might wish to spout off about. Now the fatuous prince is telling anyone who will listen that the "Islamic" way of life will solve all the world's environmental problems. Did the fanciful prince ever think to ask the various women of the world living under the benevolent blessings of Islam what they think of his royal effluence? How peaceful and eco-friendly is it for the Prophet Mohammed to marry a six-year old girl and then wait until she was nine to consummate the marriage? How about female genital mutilation, not in the Koran, but practiced by muslims in many countries, including America! Sharia law is to live under the whim and wham and whip of Allah's will. Sharia is an intellectually transmitted disease and the Prince is obviously sick. He is just one of the millions of useful Islamic fools that think freedom can be sustained by submission to Sharia. My father, A Ukranian Kulak, spent 6 years in a Soviet gulag, slave labor, timber camp. Soviet Sharia is/was not as virulent as the Islamic variation. The Sharia gulag is spreading itself into freedom's last major center of courage and immunity against indentured servitude. But then, perhaps it will be a gulag of peace? Of course it will be. Just visit two of the web's best sites to acquaint yourself thoroughly with the religion of peace: Jihad Watch and Atlas Shrugs. The submission to Islam is one of the most pernicious examples of the gulag mind set Homo sapiens have ever exhibited. Ask the French. Ask the English. Ask those in Orlando or San Bernadino. Ask yourself. Ask every political candidate-do they support America as a Sharia Free Zone? Its a simple answer: yes or no. We don't need gun free zones! We must have one nationwide Sharia Free Zone! 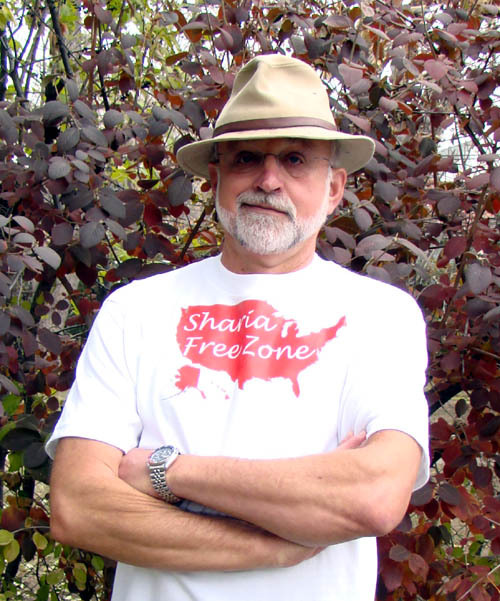 My vision is to have enough of our shirts on enough people to surround every state capitol in a Sharia Free Zone flash ceremony: circles of Sharia Free Zoners around each federal and state courthouse,mosque, and any other center of political power. Tea party members are welcome. Shipping normally occurs within 5-7 days.